1927 - 1928. June - July 1927? A close-up of the group of dancers/actors who performed at Gyantse Fort. 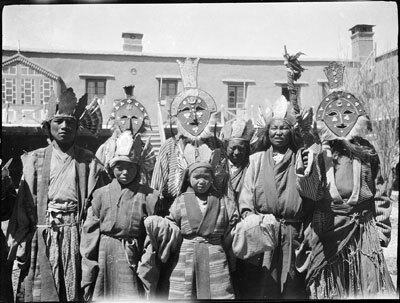 In this image their costumes, including head-gear and masks can be seen very clearly. The Tibet Album. "Performers at Gyantse Fort" 05 Dec. 2006. The British Museum. <http://tibet.prm.ox.ac.uk/photo_BMH.C.87.1.html>.